Released in 1971, Sun Moon & Herbs walks that thin line between the backwoods, psychedelic, voodoo blues of Gris Gris and the return to New Orleans r&b that the Doctor would soon explore on his next LP, 1972’s Gumbo. 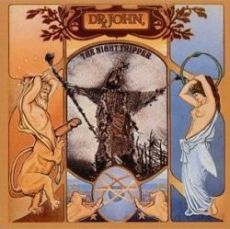 Still working under the guise of his ju-ju peddling Nighttripper alter-ego, Dr. John’s pot is full here with guests including Mick Jagger, Eric Clapton, Bobby Whitlock, and about twenty other folks lending their talents to the mix. The LP sways between the loose, out there, swamp blues he all but invented in the late sixties, but also finds itself firmly anchored by traditional song structures that would not seem out of place on the albums he would go on to record during the rest of the decade. We, Le Prix, love the good Doctor…. Zu Zu Mamou is my favorite from this album. love it when i bought it, loved it when i when i worked in New Orleans and love it stuck here in the middle of kentucky. thanks for the memories.